There are a number of things you can do to promote your website, and we have a list of 22 Marketing Tips here for you to work through, but if you’re looking for some quick solutions, here’s how to get the word out there using the tools already at your disposal. First things first, get to know your website and have confidence that you know what’s on it and how best to use it. Imagine yourself as a customer who is viewing your site for the first time. Read through the main pages, browse your products, and take an objective view at how you’re presenting your business. Then log in to the Manage section and browse through the Settings or have a read through our Support articles and Blog to get a real sense of confidence about what your site is about and how to manage it. You can of course (and should) do this step before you go live. But anytime you feel like a refresher, this is a good way to refamiliarise yourself with your website. One of the best tools to utilise is your current customer base. They already know and like you and your products, so it makes sense to let them know about your website first so that they feel included, as well as providing another avenue to market to them. And remember to include your friends circle in letting them know about the new website. While they might not be the perfect target, they may help spread the word about your new site. It’s increasingly unusual to find a business without a social media presence, most have several accounts in which to connect with the community and share content. Content that should regularly be shared on social media includes web links that raise your website’s profile and encourages sales. New product? Share it on social. On sale? Share it. Popular? Unique? Simply your favourite? Share, share, share. Simply copy the link from the page you want to share and paste it into the compose box on your chosen social media. If using Facebook or LinkedIn, you can delete the web address text in the post and the link will remain. The link needs to be included in the text for Twitter. The link will usually auto update once published to show a preview instead of just the link text. For Instagram, links don’t work on posts, so you’re best to add the link to your bio and tell people to go there. You’ve probably seen lots of times on Instagram posts it’ll finish with “link in my bio!” Just keep in mind, if you’re updating the link to specific pages, any older posts will also instruct people to go to that same place. If you have added the Share Icons to your Storbie website, you can simply navigate to the page you want to share, click the icon for the social media platform you want to share the content to, and it’ll prepare the web link for posting. 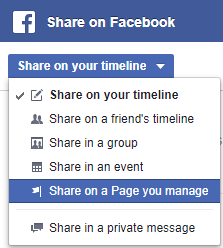 The default for Facebook will be your personal page, so remember to change from “Share on your timeline” to “Share on a Page you manage” if you want to post it on your company’s business page. For the other social networks, you’ll need to ensure you’re logged into the correct account. You can schedule posts on many platforms, especially Facebook and Twitter (others may require you to download another app), which can help you plan your social sharing ahead of time. Have a look at the current amount of activity you’re doing. We suggest at least every third social post should have a link to your website, but depending on the content you’re already providing, you may want to include it with the majority of your activity. Make sure to include your new Storbie website in all of your social bios too. If you’re using Storbie as a website platform, you already have access to a number of tools, including Marketplaces. It’s a unique feature of Storbie that you can build and join Marketplaces, which allow multiple businesses to be grouped together under a common cause to help boost each other’s discoverability. A bit like being part of a shopping complex, but in an online capacity, there are lots of Marketplaces you can join as part of Storbie. Simply log into your website, go to the Manage section and head to the Markets section to join. Now, we’re not calling your staff “tools” as such – but they are super helpful! If you have staff that look after the retail aspect of your business, then they should have access to your Storbie website. You can invite as many users as you like to manage your online shop. Simply navigate to Settings in the Manage view and select Users. Click Invite a New Admin, enter their email address and click Finish. They’ll receive an email with a link to confirm their access. The link will expire in two days to ensure security. It’s amazing what another set of eyes can do, and you may choose to delegate certain website responsibilities to other staff members. Include talk of your website in regular staff meetings and get feedback from your team on common questions, top product requests, and any other information that will not only help your in-store selling, but online too. Take a look at our 22 Marketing Tips to Promote your Online Shop, our other Marketing articles, and Support Centre for more tips and advice.